Most of you have probably wondered why I have referred to Florida on several occasions in my stories and I am here to tell you that it is no accident. I have had the great pleasure of meeting some very fine people who reside half of the year down south on the long peninsula and have found myself in envy of them on several occasions when it is 20 degrees below zero in Pinedale. Well, I have been fortunate enough to make a couple of visits to test the temperatures, and they are for real. Both trips have been in late November, early December, and I am here to tell you that the warm weather down there in the winter is no secret. Every person over the age of 50 that lives north of Georgia has found Florida, and the traffic in the great Orange State is horrendous. This past fall I was able to take part in multiple traffic jams, several near misses, and received more dirty looks than there are elk in the whole state of Wyoming. Please bear with me on this story because I will eventually find something “off the paved road”, but just not right now. 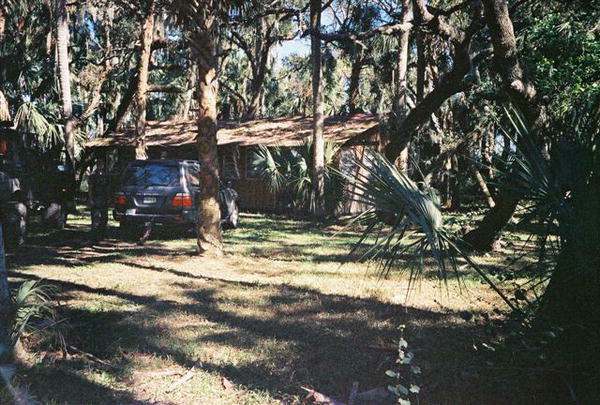 I happened to be in Florida for some real estate classes by myself on this particular trip and was staying with my great friends, Clay and Debbie Worden. The Worden’s were very hospitable, and I am grateful for them to open their home up to me on this occasion. In fact, it was kind of like being at home with the presence of their two very lively daughters. There was never a dull moment in the Worden household with a brand new swing set and trampoline that I nearly wore out every night after class, but it sure felt good after being locked up behind a desk all day. Anyhow, I was in Florida to finalize my Accredited Land Consultant designation and was getting anxious because I have been working on it for the past four years. This designation has really set me apart in my marketplace as being the expert in the land and ranch brokerage business, and I am looking forward to completely focusing my attention on the land business entirely from now on. After four days of class, a few luncheons, early morning departures to beat the traffic, and rush hour traffic jams, I was ready to get out of town. 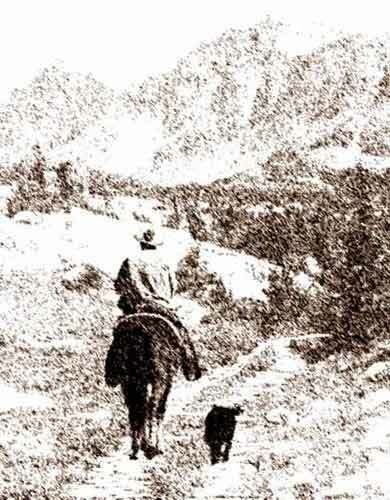 Just show me a dirt road and a pick-up truck, and thankfully for me, Clay had just the cure. By 5:00 p.m. on Saturday night we were heading to central Florida, “Cattle Country” so they call it, but on this particular night it was too dark to see much of anything. Then, at last, it finally appeared. Yes, a dirt road. Something other than pavement, and I was starting to get excited. Wild pigs were the species of interest on this particular trip, and as soon as we arrived at the hunting lease you could hear them scatter from out behind the barn. 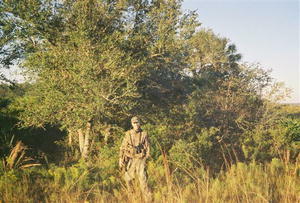 Clay assured me that they would be everywhere, and I was beginning to get the picture. 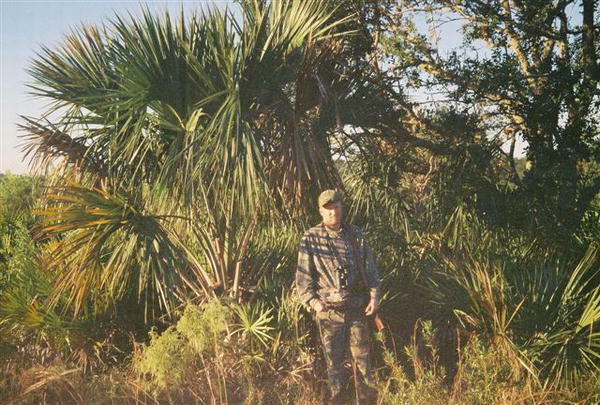 I must admit that hunting camp in Florida is just a tad bit different than wall tents, pack horses, and ten-degree nights, but this outfit was definitely rustic, and I was liking it a whole lot. The hunting lodge consisted of 2 x 4 construction built on stilts with a galvanized metal roof and cheap, single-pain windows with screens. There was a small kitchen, restroom, living room and two bedrooms with all lights powered by solar charged batteries. By now it was getting pretty late, so we unloaded the car, opened up all the windows to let the cool night air in, and set the alarm clock for an early morning hunt. I was beginning to feel a whole lot better now that the population in the near vicinity had diminished and the night was finally absent of street lights and traffic noises. I slept like a rock. 5:30 a.m. came with much anticipation of my very first hunt for something smaller than me. Some may say that wild pigs are easy, but easy or not, I was ready to give it a try. With a breakfast bar and banana devoured I was loaded up in the Ford Swamp Buggie. This truck was just like BIG FOOT and was built just for the Florida swamps. I have never seen anything like it. When you get to a ditch filled with water, or a pond, you don’t look for a crossing, you just go through it. There were some built up roads that made getting around pretty easy, and we headed out to the south to try our luck at a couple of tree stands with feeders that Clay thought would be promising. He could not have picked it better, because before it was even light, as we were walking into the stands, we were wading through a herd of pigs. You could barely make out their silhouette in the early morning light, but with lots of cattle around we were not able to shoot. Most of the morning was spent watching lots of birds that I had never seen before, and I finally couldn’t take it any longer and climbed down out of my stand and headed out to see some country. We did have the green light to harvest a doe deer as well, but things seemed a little quieter now that the cattle had all moved out and the pigs had headed to the brush. I caught up with Clay on some of the north pastures, and we put the sneak on one group of pigs that were feeding along a canal. They were just rooting along the ditch bank and had no clue we were even around. Call it what you want, but the Pig Fever must have set in because I could not have missed an easier shot at a decent sized boar and they were off like little rockets. There is definitely no time for a second shot with all of the brush and ditches, and I was getting the razzing of a life time. Clay was getting back at me for some gestures I had made on a couple of Wyoming elk hunts, and I was hanging my head pretty low wondering how I could have missed such an easy shot. Better luck next time, I guess, but in the back of my mind I was just wondering if I had blown my only opportunity. We headed on in to the lodge for an early lunch and to catch up with some of the other hunters who happened to be spending the day. 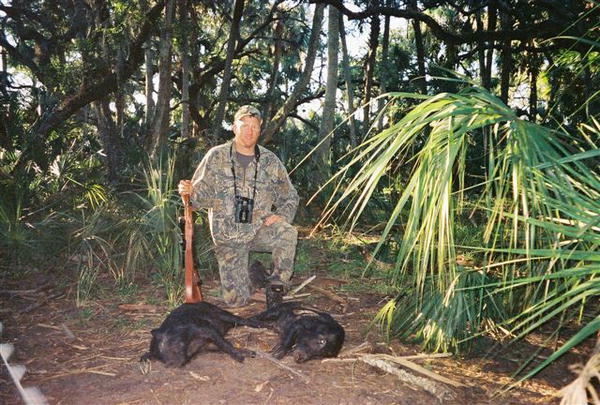 Kevin and his two boys, along with Kevin’s friend, had been hunting for some deer and pigs on the north end of the property, but nothing connected there either. We spent a few hours cleaning up around the lodge, burning some trash and just picking up from the hurricane weather that had blown lots of stuff around. 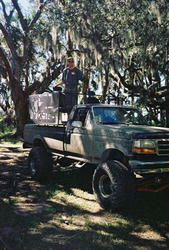 We finished bolting down the swamp buggy rack and then we were off for some true road hunting. I had never seen anything like it. Kevin jumped in the driver’s seat, and then on the back of the bed was a big rack with a platform where two captain’s seats and a big bench seat were bolted. There was a four-foot railing around the platform so that you couldn’t fall off, and the back was open so you could climb up and take a seat. You have got to understand that this is entirely against my nature to do any kind of hunting from the seat of a pick-up truck, but the boys from Florida assured me that I better just sit tight and get ready to shoot. It took awhile for us to find the first bunch of hogs, but when we did the lead did fly. From the vantage point on top of the truck you could see down into the grass and weeds, so it was definitely an advantage and a blast. Pigs would run everywhere and you just had to concentrate to stay on the one you where shooting at. 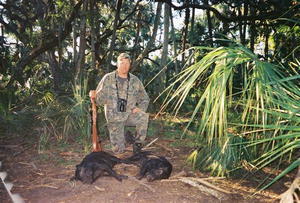 Kevin’s boys had a ball, along with myself, and before the day was over we had taken five really good eating wild hogs. I never did find a big boar like I had hoped, but the next day Clay and I did spend some more time checking out the hunting territory and stumbling into a few more nice sized eaters. It was an experience I will never forget, and I hope to take my son, Clancy, down to Florida next year where he can experience some of what Florida has to offer “off the paved road."